There was no doubt that the most exciting time to explore Downtown Las Vegas was during its 2016 Life is Beautiful festival. Spread over 11 city blocks, this highly progressive 3-day event was so much more than just another music festival– It was a celebration of life and culture, boasting over 50 art installations, a "Learning Series" that featured numerous inspirational and educational speakers, food and drink vendors from a multitude of culinary disciplines, and four stages of music hosting over 70 top-tier musical acts. Of those four stages, Insomniac Event's Troubadour Stage deployed PK Sound's advanced robotic line array, Trinity. Insomniac Events and PK Sound provided event goers with a fully immersive experience at the Troubadour Stage that included over 25 headlining artists, a deeply engaging stage design with phenomenal special effects and a Trinity system that provided crystal clear, powerful sound to the thousands of festival-goers who packed the stage. Among the headliners, there were some crowd favorites who made the Trinity system shine, including Bassnectar, Galantis, Excision, Seven Lions, ZHU and Gramatik. “Insomniac works with a pretty high bar production-wise; They never disappoint with their high production quality, and the lineup is no exception. The highlight of our weekend was seeing the PK Sound and Bassnectar relationship come full circle—it was his first time playing on the Trinity system. No one was disappointed. 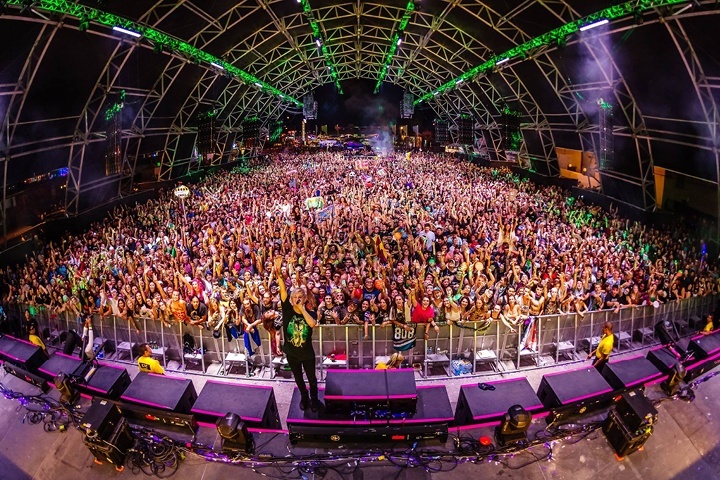 The Bassnectar creative team brought their unique visual wizardry through lighting, video and lasers, while the Trinty system delivered the high-impact, enveloping audio experience that both Bassnectar and PK fans expect,“ said Arlen Cormack, VP of Production at PK Sound. The sound system included 14 Trinity modules flown per side as the main hangs, as well as 6 additional flown Trinity speakers per side for delays. For the low-end, 48 CX800 dual 18" high power subwoofers were used as part of the main PA, along with another 4 CX800 per side flown directly behind the Trinity delays. Throughout the festival, the Troubadour stage had some of the largest crowds due to the high quality sound and big acts that graced the stage. Every event is different and each come with unique challenges. The benefits of Trinity's ability to remotely sculpt the sound field came into play tuning the system for the extra-long dance floor of the Troubadour stage. 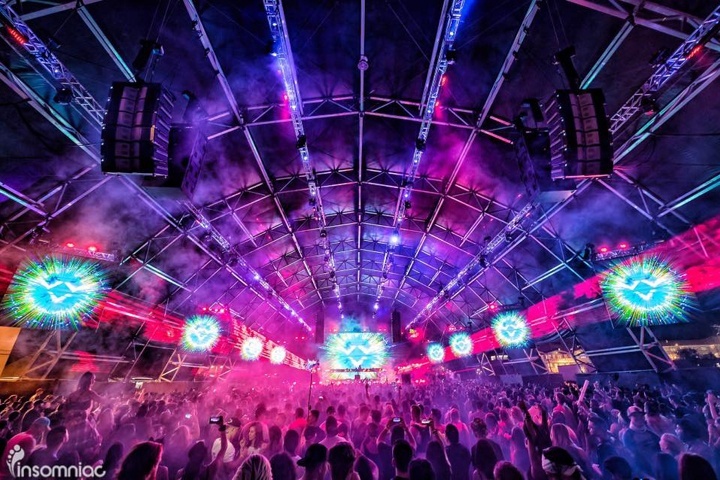 “The tent was a long-throw, so rather than overpowering fans up front we hung delay speakers about 180' from the stage, and with Kontrol software we tightened up the CMI waveguides of Trinity to focus the sound further back. We then time-aligned them to the main hang for complete transparency throughout,” says Ian Hicks, FOH for Bassnectar and Sound Engineer at PK Sound. Considerations like this are key for providing a consistent experience for all audience members. After all, not everyone has the will or desire to fight their way to the front of a packed house, which the Troubadour Stage was indeed. Trinity was a big part of the success at the stage. Being able to focus and sculpt the sound is key for maximum customizability before and during performances. “Using Trinity's unique directional high frequency control abilities, we prevented phasing and unwanted reflections from bouncing off the side walls of the tent. We also remotely angled all the boxes from flat to a pre-calculated array curve while they were in the air,” explains Ian. Conveniently moving sound equipment after it’s already flown is something that was not possible before Trinity was introduced. Because of this innovative technology, though, the team could easily focus the sound in the Troubadour Stage’s long, domed tent for an optimal audio experience. Life is Beautiful was an extremely successful festival on many fronts, from its endeavors to revitalize the often-overlooked Downtown Las Vegas, to bringing together the finest talent and most passionate people from around the world. PK Sound was grateful to have worked closely with Insomniac Events to bring the Troubadour stage to life and be a key part of the Life is Beautiful experience. 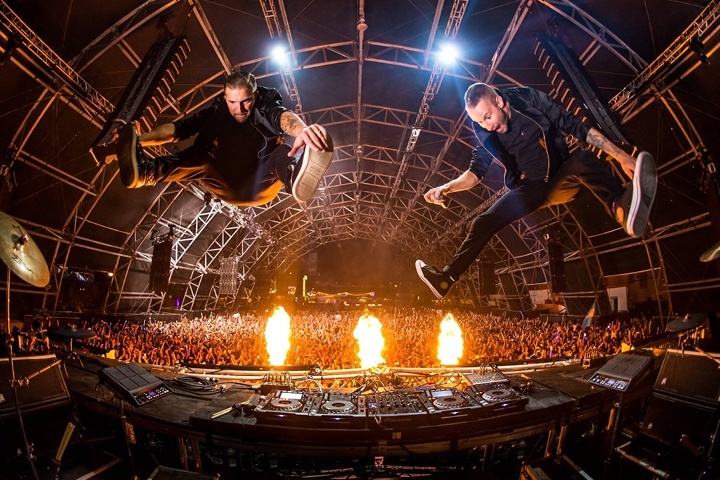 To check out the latest from Insomniac Events visit: https://www.insomniac.com/. CLICK HERE to learn more about Trinity and 3D Wavefront Control.